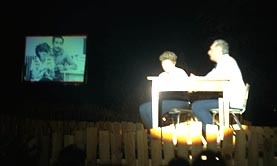 The stage was set up on a large lawn outside the kibbutz's main eating hall. It was late August, and the weather was perfect for an outdoor evening. The "hill" behind the woman at the microphone represents Tel Tzuba. Various movies and slides could be projected on the screen behind the stage. As you can see, they brought in a big professional lighting and sound system. 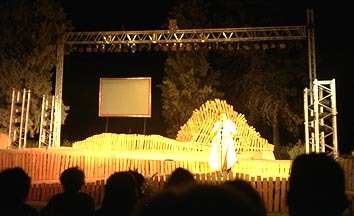 The show told the story of the kibbutz. At various points, they put slides on the screen showing original members in the olden days, and the same people would then be shown on stage, in the same poses, and you could hear what they were saying (or thinking) when the original photo was taken. After the kibbutz was built, immigrants came in various waves from many places. 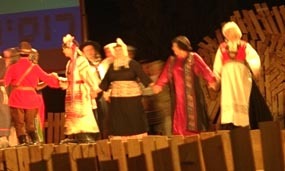 Here some members do a dance in costumes native to their homelands. On the screen, flags from different nations showed how many immigrants came from each, as more and more members came out on stage until the stage was full. 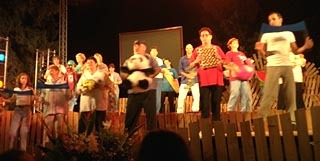 The members did a dance to show the various kibbutz industries. In the front row, three people are holding windshields; the guy in the middle with the panda is the one who runs the zoo.